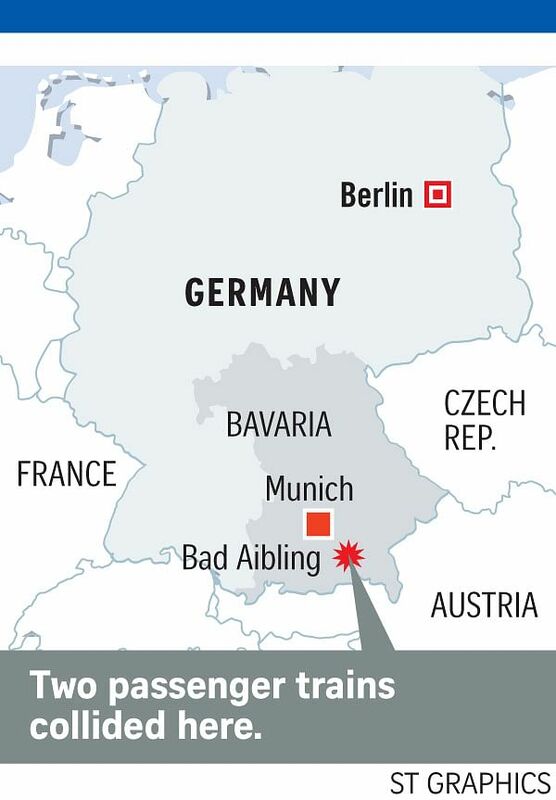 BAD AIBLING (Germany) • Two commuter trains crashed head-on at high speed in southern Germany yesterday, killing at least nine people and injuring more than 100, in one of the country's deadliest rail accidents in years. The accident, Germany's first fatal train crash since April 2012, occurred on the single-track route between Rosenheim and Holzkirchen shortly after 7am (2pm Singapore time). The cause is unknown. Hundreds of rescuers were scouring for passengers who could be trapped in the wreckage, in a wooded area near Bad Aibling, a spa town about 60km south-east of Munich. At least two carriages from one train were overturned, while the front of the other was crushed. Blue, yellow and silver metal debris was strewn around the crash site next to a river in the southern state of Bavaria. "We now have nine dead," said police spokesman Juergen Thalmeier. Two persons were still missing, reported the BBC. Eighteen people were seriously injured and 90 had light injuries. The two train drivers and two conductors were among those killed, local broadcaster Bayerischer Rundfunk reported. An investigation is ongoing to determine if the accident was caused by "a technical problem or human error", Transport Minister Alexander Dobrindt told news channel NTV, adding that one of the trains had "drilled" into the other, leaving a carriage "totally dismantled". He described the scene as a "horrible picture", saying it was estimated the trains had been travelling at about 100kmh, CNN reported. Mr Dobrindt said the three black boxes on the trains should help shed light on the cause of the accident. Two of the black boxes have already been recovered, he added. Hundreds of firefighters, emergency services workers and police officers were deployed in the rescue operation, which was made more complicated because the forest crash site was difficult to access. Rescuers were using electric saws to cut through the mangled wreckage. About a dozen helicopters were involved in the operation. Rescue workers from nearby Austria were also on site, NTV said. German Chancellor Angela Merkel said in a statement: "I am dismayed and saddened by the serious train accident this morning at Bad Aibling. My sympathy goes out especially to the families of the nine people who have lost their lives."